SAN FRANCISCO, CA (November 9, 2018) — Long admired for her skillfully detailed renderings of natural imagery, Vija Celmins has created paintings, sculptures, drawings and prints for more than five decades. From December 15, 2018, through March 31, 2019, the San Francisco Museum of Modern Art (SFMOMA) presents the global debut of Vija Celmins: To Fix the Image in Memory, the first North American retrospective of the artist’s work in more than 25 years. Featuring nearly 150 works, the exhibition spans the breadth of Celmins’s career, from the 1960s to the present. Organized in loose chronological order by subject — including studio objects, disaster works, oceanscapes, lunar drawings, desert floors, night skies and spider webs — it presents a wide variety of media, including paintings, drawings in graphite and charcoal and sculptures. Celmins began her career in Los Angeles, where she became one of the rare 1960s female artists to be recognized by her male peers and develop significant standing. In the early 1980s, she moved to New York, and is one of few figures to have been embraced by the art communities on both coasts. A singular artist, Celmins has never adhered to one particular artistic style, nor aligned herself with a movement or any particular group. The artist’s work reflects an extraordinary attention to materials and technique, and possesses a remarkable level of detail and subtlety. It is anchored in a reappraisal of images and memory. “As you move through the exhibition galleries, the works’ mesmerizing seduction suggests a pause, asking you to stop, to look, to truly see and attempt to remember, to fully experience a moment in time,” said Garrels. As a graduate student at the University of California, Los Angeles (UCLA), in the 1960s, Celmins was very different from other Los Angeles artists at the time, who typically employed intense, vibrant colors in their work. During her studies in 1964, she made a series of still lifes of objects from her studio. These works were devoid of expressive brushwork and were rendered in a predominantly gray palette that allowed her to minimize decisions about color. Rather than inventing her subjects, Celmins aimed to “redescribe” them. Works such as Envelope (1964) and Heater (1964) are examples of this extreme distillation; pared back from simple descriptive rendering, they have an intense physicality. In this gallery, material is as important as image. 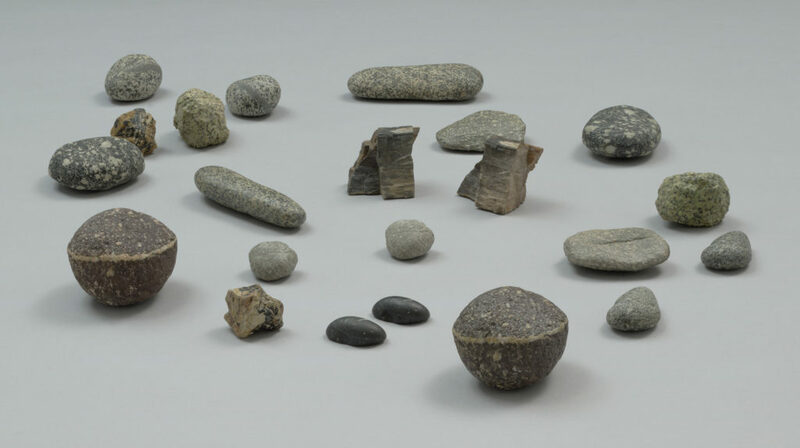 In the mid-1960s Celmins also made a few objects that she characterized as having “fallen out of the picture plane.” Like her still-life paintings, these sculptures are “redescriptions,” mostly of items from her studio, such as erasers and a pencil. They also include an oversize comb — Comb (1969–70) — inspired by René Magritte’s Personal Values (1952), a cornerstone of SFMOMA’s collection, which will be on view in the museum’s second-floor galleries. When Celmins was a child, the Soviets invaded her homeland of Latvia near the end of World War II, and she fled the country with her family. After moving between refugee camps in Germany for several years, the family’s passage to the United States was finally sponsored by an aid organization, and they ultimately settled in Indianapolis. In the mid-1960s, as the Vietnam War and associated protests were escalating, Celmins began to collect clippings of war imagery from newspapers, magazines, and books, recalling memories of “soot and trains and bombs from my very early times.” These images became central in her work, appearing first in paintings such as Suspended Plane (1966) and then in a series of small-scale graphite drawings, such as Pistol (1968) and Zeppelin (1968). Celmins’s second studio in Los Angeles was not far from Venice Beach, and in the mid-1960s, she began taking photographs of the ocean, which became a central subject of her drawings for the next 10 years. The images on view were formed by different strokes and densities of marks; highlights were created by allowing portions of the paper to remain visible, as seen in Untitled (Big Sea #2) (1969), among others. Throughout her career, the artist has returned repeatedly to the same subjects, such as the ocean. “I tend to do images over and over again, because each one has a different tone, slant, a different relationship to the plane, and so a different meaning,” shared Celmins. When Celmins was taking photographs of the ocean in the late 1960s, satellites were capturing the moon’s surface as Americans and Soviets raced to reach it. Attracted by their range of silvery grays, the artist began collecting these images from newspapers, magazines and astronomy books. She eventually amassed a large personal archive, on which she based a number of drawings, such as Untitled (Double Moon Surface), 1969. These compositions were determined by her decisions of which images to use; like the ocean works, they faithfully document any camera distortion, glare or blurriness in the source photographs. In the early 1970s, Celmins began taking driving trips to deserts in California, northern Arizona and New Mexico. Becoming ever more engaged with the landscape, she took photographs of the desert floor as she collected astronomical photographs of galaxies, and she began a series of drawings of both subjects, often developed in relation to each other. Highlights of this gallery include To Fix the Image in Memory I–XI (1977-82), from which the exhibition subtitle comes. Comprised of 11 pairs of found stones and their bronze casts, whose surfaces were fastidiously painted, this work was created over the course of five years, to redescribe the original stones. In 1992, Celmins settled her focus on the night sky. The artist’s interest in materiality is evident in all her work, particularly in the night sky compositions. Among the canvases on view is Night Sky #16 (2000–1), in which more than 20 layers of paint were sanded off and reworked time and again. In the night sky works, ivory blacks were sometimes mixed with burnt umber, ultramarine blue or bits of white. Circles drawn at different sizes for stars were filled with tiny drops of liquid rubber that were sanded off as layers built up. Celmins remains acutely aware of the perceptual effects this labor creates. The exhibition continues by tracing Celmins’s return to drawing in 1994, when she kept the night sky as her primary subject, this time working with charcoal rather than graphite to create compositions such as Untitled (Hubble #2) (1998). In 1992 — the same year Celmins began to concentrate on the night sky — she made a single painting of a spider web based on an image she found in a scientific text in a used bookstore. Not until 1998 would she return to that subject, in paint, in charcoal — as in seen in the delicate Web #1 (1998) — and in charcoal and graphite together. As a flat structure, the web not only aligned with the small, rectangular formats of Celmins’s canvas and paper supports but also provided a kind of grid from which she could build her compositions. This gallery explores her attraction to this motif, which she proceeded to work with off and on for the next eight years. Over the last 20 years, Celmins’s work has grown more open and expansive. She is increasingly direct in her painting of the night skies, with less sanding and layering. She has returned to earlier motifs, such as the gun from her “Disaster Works,” and has created new paintings based on found objects, such as Japanese Book (2007–8). In the gallery of recent works, visitors will also see depictions of objects in her studio — close-ups of shell fragments, pieces of porcelain — that reference her early still lifes but now extend to the edges of her canvases, filling the frames like her earlier ocean and night sky compositions. Other recent works in this gallery reflect an interest in memory and the passage of time. 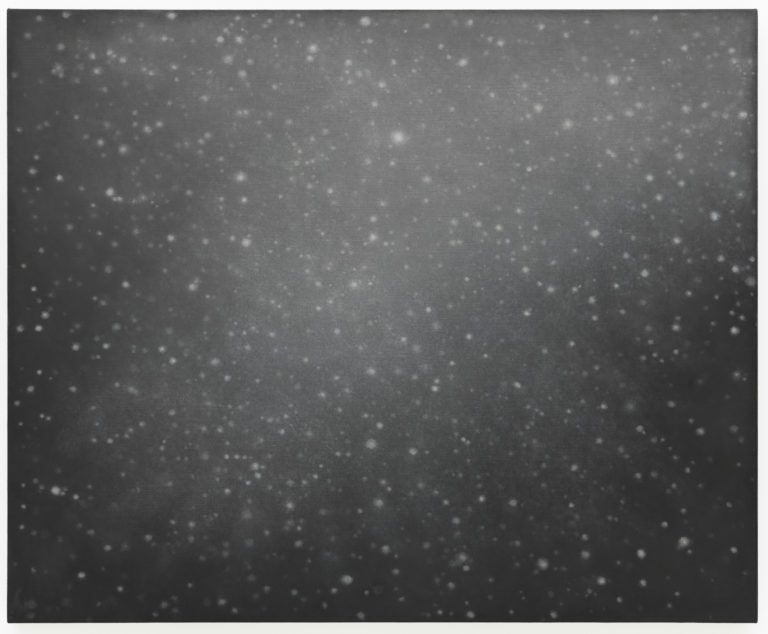 In the late 1990s, Celmins began to collect children’s slate blackboards. She engaged a sculptor and furniture maker to create duplicates of some of the tablets, which she then painted to replicate the originals as closely as possible for works like Blackboard Tableau #1 (2007–10). The ocean also continues to be a subject of central interest to Celmins. After living with one of her earliest ocean paintings in her studio for several years, she painted five variations, slightly changing the size and palette of each. In recent decades, she has painted larger night skies, some at the same scale as her first, Barrier (1985–86). An ever evolving artist, in 2000–1, Celmins adopted a new approach, using a light rather than dark ground: a reverse night sky. Darkened highlights echo stars, and touches of color enliven and enrich the ground. Throughout her career, Celmins has shifted fluidly between these different media, approaching each one with equal seriousness and intensity. Vija Celmins: To Fix the Image in Memory celebrates the full, extraordinary range of the artist’s career. Born in Riga, Latvia, Vija Celmins fled the country with her family near the end of World War II before the Soviet occupation. They lived in refugee camps in Germany until immigrating to Indianapolis in 1948. Celmins studied art at the Herron School of Art and Design at Indiana University and attended a summer session at Yale University before entering the MFA program at the University of California, Los Angeles, in 1962. She relocated to New York in the early 1980s. In 1992, the Institute of Contemporary Art in Philadelphia organized the first retrospective of her work; she also has been presented in solo exhibitions at the Centre Pompidou, Paris; the Hammer Museum, Los Angeles; the Menil Collection, Houston; the Metropolitan Museum of Art, New York; the Museo Nacional Centro de Arte Reina Sofía, Madrid; the Museum of Contemporary Art, Los Angeles; the Walker Art Center, Minneapolis; and the Whitney Museum of American Art, New York. Celmins was inducted into the American Academy of Arts and Letters in 1996 and received a MacArthur Fellowship in 1997. The exhibition is co-curated by Gary Garrels, Elise S. Haas Senior Curator of Painting and Sculpture at SFMOMA, and Ian Alteveer, Aaron I. Fleischman Curator, Department of Modern and Contemporary Art at the Met, with Nancy Lim, assistant curator of painting and sculpture, SFMOMA, and Meredith A. Brown, research associate, Department of Modern and Contemporary Art, the Met. Major support for Vija Celmins: To Fix the Image in Memory is provided by the Mimi and Peter Haas Fund. Generous support is provided by the Barbara and Gerson Bakar Foundation, the Gerson Bakar Foundation, Gay-Lynn and Robert Blanding, Janine and J. Tomilson Hill, Marguerite Steed Hoffman, Agnes and Edward Lee, Susan and Larry Marx, Komal Shah and Gaurav Garg, Sheri and Paul Siegel, and Pat Wilson. Additional support is provided by Alka and Ravin Agrawal. Research for the exhibition was supported in part by SFMOMA’s Artist Initiative, which is generously funded by a grant from The Andrew W. Mellon Foundation. Vija Celmins: To Fix the Image in Memory is accompanied by a 272-page catalogue featuring approximately 210 illustrations and contributions from Ian Alteveer, Meredith A. Brown, Briony Fer, Russell Ferguson, Gary Garrels, Suzanne Hudson, Frances Jacobus-Parker and Nancy Lim. The catalogue is edited by Gary Garrels and published by the San Francisco Museum of Modern Art in association with Yale University Press, New Haven and London. Open Friday–Tuesday, 10 a.m.–5 p.m., and Thursday, 10 a.m.–9 p.m. Closed Wednesday. Holiday hours: Open December 24 and December 31, 2018, 10 a.m.–4 p.m.; open Wednesday, December 26, 2018 and Wednesday, January 2, 2019, 10 a.m.–5 p.m.; closed December 25, 2018. Adult general admission to SFMOMA is $25; admission for seniors 65 years and older is $22; and admission for visitors ages 19 through 24 is $19. General admission and special exhibitions for all visitors aged 18 and younger are free. Private guided tours and group discounts for Vija Celmins: To Fix the Image in Memory are available through the SFMOMA Group Sales team. Tours are one hour in length and are not included with museum admission. Tours must be booked at least two weeks in advance. For more information or to submit an inquiry, please visit sfmoma.org/groups.